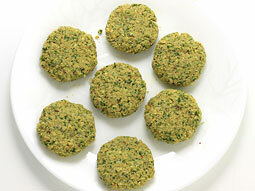 Falafel, a crispy pattie (or ball) made from (kabuli chana / garbanzo beans) or fava beans, is one of the widely known and appreciated traditional middle eastern food item. It is best enjoyed with Salad, Hummus, Baba Ganoush and Tahini Sauce. To make falafel from scratch, dried chickpeas are soaked for 8 hours and then ground with onion, garlic, parsley, cilantro, cumin seeds, coriander powder, red chilli powder and breadcrumbs (or flour) into a mixture and then patties prepared from it are cooked by following any one of the these methods; 1. deep frying, 2. shallow frying, and 3. baking. Deep frying is a traditional method and gives it a best possible crispy texture whereas baking or shallow frying method try to reduce the total calorie count. 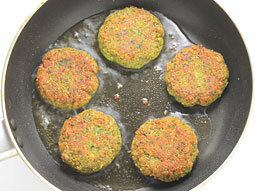 This Falafel recipe uses the shallow frying technique to keep balance between taste, texture and calories and explains the entire process with step by step photos. Serve it as an evening snack with salad, pickled vegetables, hummus and tahini sauce. 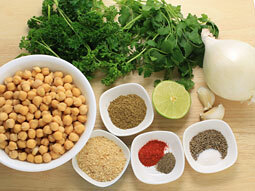 Soak dried chickpeas in 2-cups of water for around 8 hours or overnight. After 8 hours, drain the water and rinse them well. Transfer them to a colander to drain water completely. 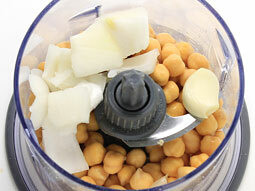 Place chickpeas, onion and garlic in the jar of a food processor or a blender. 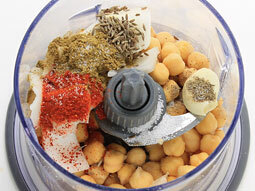 If the jar is small, process the chickpeas in two batches. Add cumin seeds, cumin-coriander powder, red chilli powder, black pepper powder and salt. 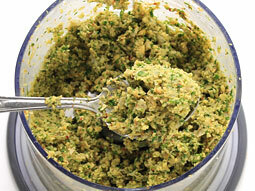 Add parsley, cilantro, lime juice and breadcrumbs. Process them until medium coarse texture. If required, open the lid in between and scrap the sides with spatula for even blending. Don’t add water while blending. Transfer the mixture to a large bowl. Taste it and adjust the seasonings according to your taste. If the mixture is too much wet, add 1-2 tablespoons breadcrumbs and mix well. It should hold together easily to make patties. Take a small lemon sized portion of the mixture and make a round shaped ball from it. Press it gently between your palms to flatten it and give pattie like a shape. 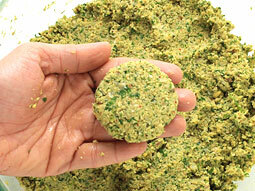 Make patties from remaining mixture in similar way. Heat 2-3 tablespoons oil in a frying pan over medium flame for shallow frying. Increase or decrease the oil amount depending on the size of a pan as it should cover the base of the pan. 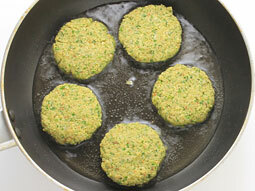 Gently place 4-5 patties in the pan once oil is medium hot and ready for shallow frying. Cook for around two minutes or until bottom surface starts to turn golden brown and then flip them. Cook another side until the bottom surface turn golden brown. Flip and cook until both sides turn golden brown as shown in the picture. It will take around 3-4 minutes total to cook both sides. Transfer them over to a kitchen napkin placed on a plate. 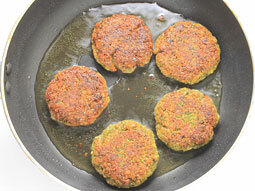 If remaining oil in pan is not sufficient to cook next batch of Falafel patties, add 1-2 tablespoon oil and shallow fry the remaining patties. 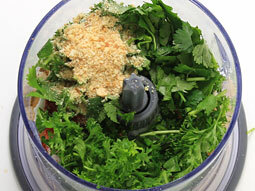 Adjust the amount of parsley and cilantro (reduce to 1/2 cup each or increase to 1 cup each) as per your preference. Make sure that texture of the mixture is coarse – do not over process it into very smooth texture in step-5. Smooth texture if mixture will result in denser Falafel. 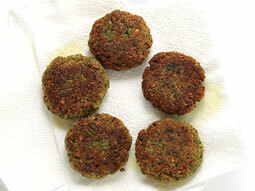 You can cook Falafel in 3 different ways – by shallow frying in a pan, by deep frying or by baking in oven. Choose shallow frying method as explain above in this recipe to reduce the calorie and get same crispy texture as you would get with deep frying.. Choose deep frying method to make it in a traditional way and get crisper outer layer. For deep frying, cook them in oil over medium flame until golden brown and crispy from outside. Mix 2-tablespoons of all purpose flour (maida) in the mixture to prevent them from falling apart while deep frying. Choose baking method if you need to prepare it in large quantity and also want to make it a low calorie. 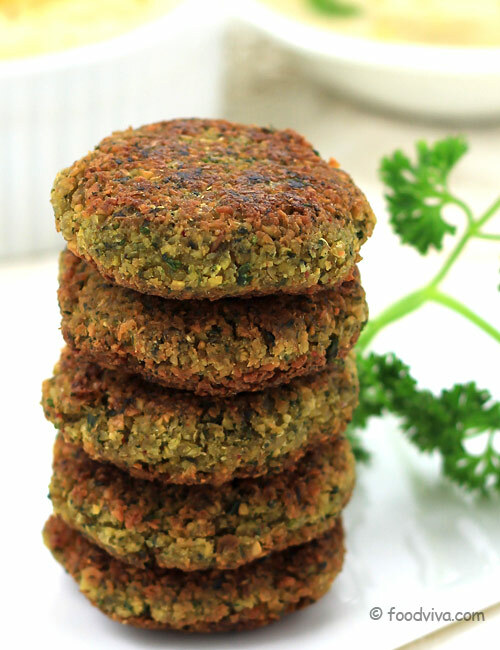 For baked falafel, place patties on a greased tray and bake in preheated oven at 400 F (200 C) for 30-35 minutes or until both sides turn light brown, flip the patties once after 15-minutes. 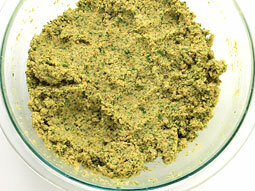 Serving Ideas: Serve falafel with tahini sauce or hummus or baba ganoush or tzatziki sauce and salad. You can also serve it in pita as a sandwich. To make falafel pita sandwich, place 2-falafel, chopped lettuce, sliced onion, and chopped tomato in a halved pocket pita bread and top with hummus and tzatziki sauce. I like the recipe, it's easy way to grind all items together. 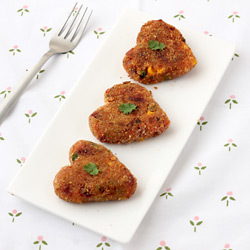 Healthy for family starter and also good for school kids tiffin. We can also add it to make rolls and burger.